We held our first meeting of the year at our new meeting place, Primitive Gatherings. They were so welcoming and had the door unlocked early so we could get in set up and ready. The first order of business was to introduce the new board, Jan is president, Jessica is vice president, Maritza is secretary, Colleen is returning a treasure, Angelica is social media and Susan is charity. We introduced our new Block of the Month program; you can read all about it by clicking the Block of the Month tab at the top of the blog. We've had various members sign up to introduce a different 12.5 inch block each month. This month Angelica introduced the Heart Block for February. We're asking all members to make at least one block each month to donate to our Charity Quilt effort. Also, you can consider this a Quilt Along and make one or more for yourself. 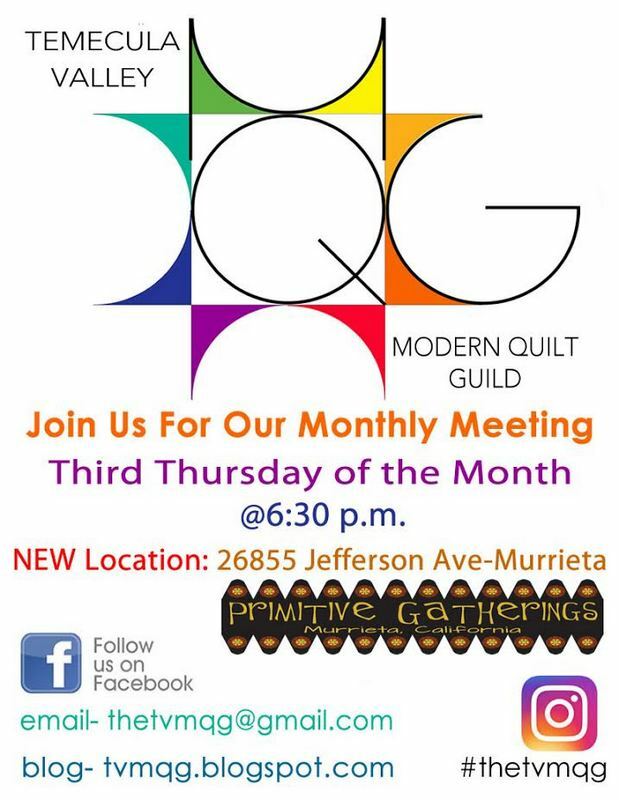 Colleen gave a presentation on how to access and use the MQG website, Many features are available to MQG members. Show and tell is always my favorite meeting component. Here are some of the candid highlights! Angelica showed off the new Rainbow Tote she made the morning of the meeting. Of course she had all her fabric ready to go, but it was fast to put together. She adapted the one hour basket tutorial from Kelby Sews, to make the tote. Next up, we had some kiddos in the house! Above, Kelsy showed off her first quilt. Great job, Kelsy. Below, Lotte showed us her first quilt. Her favorite block is the one on the lower left. Another great job! Collen is showing an improve quilt to she made 2 years ago. She's hoping that my showing it at the meeting she'll be encouraged to finally finish the quilt. Let's hear it for Colleen. Go, girl, go! Natalie, brought a problem that she was having trouble solving. With in a couple of minutes the problem was diagnosed, so she could get back on track. Maritza has been taking an online class in Heirloom sewing. This is one of the lovely products she's make for the class. She's doing a great job. I had two quilts featured in the current Quilty "Easy Modern Quilts" magazine, so I wanted to show them off. I showed a commissioned quilt that is going in the mail to NC, this week. The pattern is Stereo by Jaybird Quilts and the fabric is Adventure Awaits by Spoonflower. I piece the quilt backs 90% of the time; I think that makes the quilt more interesting. The second quilt finish I wanted to show is The Most Boring Quilt In The World! The pattern is Lawn Diamond by Sarah Quilts. It's boring because it's all paper-piecing; the same block, over and over. The fabic is Kona solids. 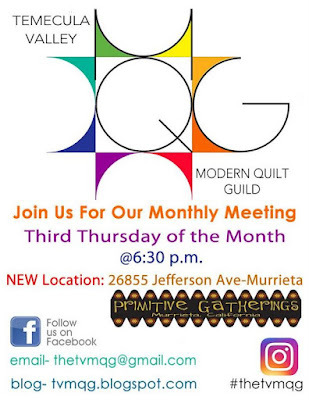 All the members of the Temecula Valley Modern Quilt Guild owe a huge thank you to the courageous women who stepped up and led us through our inaugural year. It's been one year under the guidance of Jessica, Jane, Colleen and Natalie. You've set the bar high for the new board, and got our guild off to a great start!